U.S. House Speaker Nancy Pelosi is setting a high bar for impeachment of President Donald Trump, saying he is "just not worth it," even as some on her left flank clamour to start proceedings. Pelosi said in an interview with the Washington Post that "I'm not for impeachment" of Trump. "Unless there's something so compelling and overwhelming and bipartisan, I don't think we should go down that path, because it divides the country," she said. While she has made similar comments before, Pelosi is making clear to her caucus and to voters that Democrats will not move forward quickly with trying to remove Trump from office. And it's a departure from her previous comments that Democrats are waiting on special counsel Robert Mueller to lay out findings from his Russia investigation before considering impeachment. Thinking among Democrats has shifted slightly, in part because of the possibility that Mueller's report will not be decisive and because his investigation is more narrowly focused. Instead, House Democrats are pursuing their own broad, high-profile investigations that will keep the focus on Trump's business dealings and relationship with Russia, exerting congressional oversight without having to broach the I-word. Oversight and reform committee chairman Elijah Cummings, one of the lawmakers leading those investigations, said he agrees with Pelosi, and Congress needs "to do our homework." He said impeachment "has to be a bipartisan effort, and right now it's not there." Still, Pelosi's comments could stoke a stubborn tension with those who believe impeachment proceedings should have begun on Day One of the new Congress. Some freshman Democrats who hail from solidly liberal districts haven't shied away from the subject — Michigan Rep. Rashida Tlaib used a vulgarity in calling for Trump's impeachment the day she was sworn in. Billionaire activist Tom Steyer, who is bankrolling a campaign pushing for Trump's impeachment, shot back at Pelosi on Monday: "Speaker Pelosi thinks 'he's just not worth it?' Well, is defending our legal system 'worth it?' Is holding the president accountable for his crimes and coverups 'worth it?' Is doing what's right 'worth it?' Or shall America just stop fighting for our principles and do what's politically convenient?" 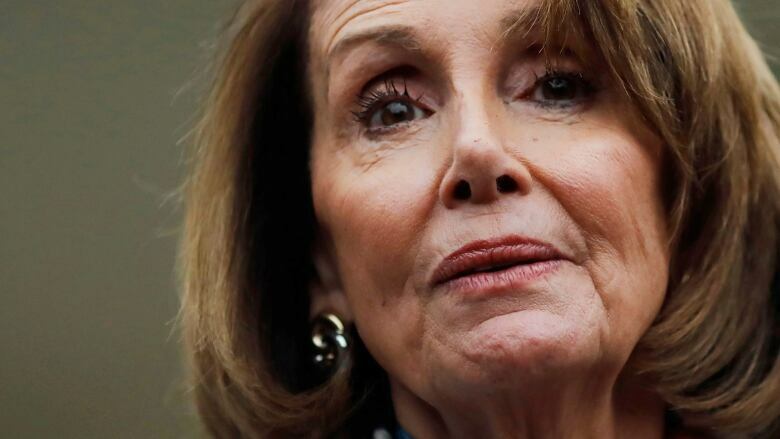 Neil Sroka of the liberal advocacy group Democracy for America said Pelosi's comments were "a little like an oncologist taking chemotherapy off the table before she's even got your test results back." Other lawmakers who have called for impeachment looked at Pelosi's comments more practically. Sherman said the multiple Democratic investigations of Trump might be a substitute for impeachment. "It's also possible it will be a prelude." Republicans alternately praised Pelosi and were skeptical. White House press secretary Sarah Sanders said "I agree" in response to Pelosi's words. Sanders added of impeachment, "I don't think it should have ever been on the table." House Republican leader Kevin McCarthy said it was a "smart thing for her to say," but Georgia Rep. Doug Collins, the top Republican on the judiciary committee, said he doesn't think it's "going to fly" with some of Pelosi's members. "I do believe what Speaker Pelosi understands is that what they're wanting to do is going to require far more than what they have now, so I think they are hedging their bet on it," Collins said. Pelosi has long resisted calls to impeach the president, saying it's a divisive issue that should only be broached with "great care." She refused calls when she first held the speaker's gavel, in 2007, to start impeachment proceedings against George W. Bush. Having been a member of Congress during President Bill Clinton's impeachment, she saw the way the public turned on Republicans and helped Clinton win a second term. Heading into the midterm elections, she discouraged candidates from talking up impeachment, preferring to stick to the kitchen table issues that she believes most resonate with voters. Pelosi has often said the House should not pursue impeachment for political reasons, but it shouldn't hold back for political reasons, either. Rather, she says, the investigations need to take their course and impeachment, if warranted, will be clear. Freshman Democrats who are from more moderate districts and will have to win re-election again in two years have been fully supportive of Pelosi's caution. "When we have something that's very concrete, and we have something that is compelling enough to get a strong majority of Americans, then we'll do it," said Democratic Rep. Katie Hill of California. "But if it's going to be a political disaster for us, then we're not going to do it."